When it comes to my interior design aesthetic, I tend to lean towards more modern, simplistic design with subtle pops of color seamlessly interwoven throughout the area. Yet, this does not mean, I can’t appreciate other design philosophies as well. I am very taken with homes that have a natural, rustic look to them. Sometimes, it look very manufactured, but when it’s done correctly, it can be breathtaking, like the bathroom pictured above. 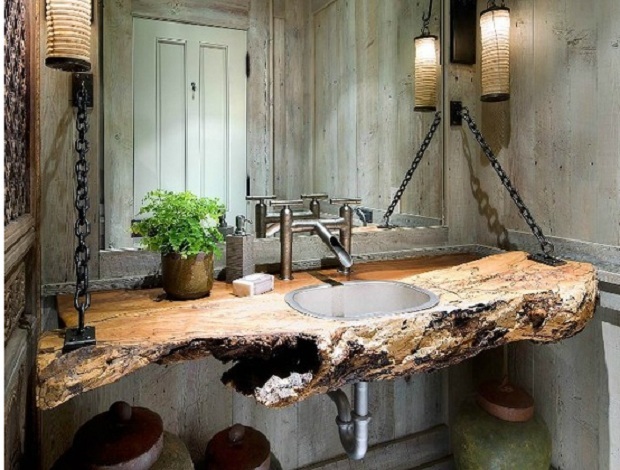 I love the unpolished wood panel of the walls and the half tree stump that makes up the sink. If you are going to go with this theme, you have to commit: it would be very odd to walk from a modern futuristic kitchen and enter a rustic, low maintenance bathroom. I love this image!!! What a terrific idea for a bathroom sink. Thanks for posting!